This entry was posted on October 19, 2018 by Amberley Publishing. The starting point of the journey is the iconic and recently restored and extended St. Pancras station which sits cheek by jowl with the understated Kings Cross in an area of London that had a reputation for ‘ladies of the night’ in the nineteenth century but which has now expanded its late night seediness to include the peddling of class A drugs. London main line termini have usually attracted negative comment and Waterloo is often held up as a centre for the homeless and rough sleepers. 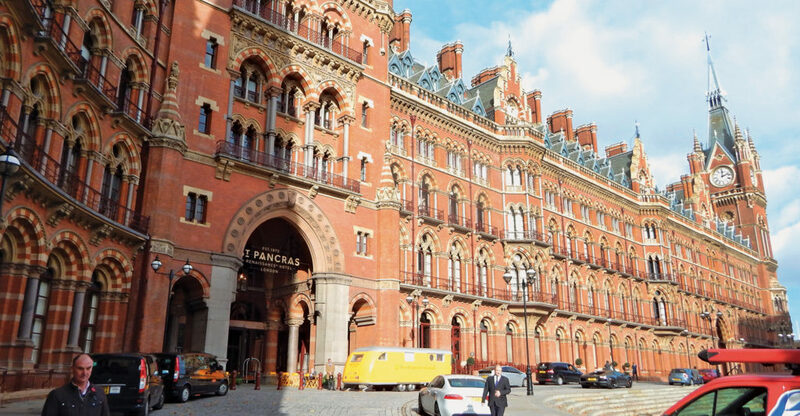 St. Pancras though has a new sophistication with a champagne bar that seems a world away from the Burton’s brewery trains that used to enter Midland Railway St. Pancras underground as if the worker’s tipple should be not only not seen but not heard. Of course beer was not the only import from the Midlands and the bricks from which the station was built were brought there by train for the first time. The Eurostar terminal underlines this new up-market image and ordinary travellers are segregated from the supposed international elite by a glass security fence. This simply seems to echo the past in the 19th century provision of 1st, 2nd and 3rd class waiting rooms except that in modern times the concern is more to do with international terrorism than the class war. We start our journey on the poorer side of the tracks and soon head north through the London borough of Campden and the restored Roundhouse theatre which had been the Midland Railway’s Campden engine sheds bustling with Royal Scot and Jubilee locomotives to haul the crack steam expresses. Kentish Town with its large Irish population, founded from the people who built the Midland Railway into the capital also had a steam era engine shed mainly for freight locos. The area has acquired a new gentrification although described as ‘edgy’. Cricklewood is the next slice of the metropolis and there were the MR marshalling yards and engine sheds for the freight trains that kept part of London supplied with fuel in the shape of coal and pollution in the shape of smog. The coal trains ran day and night and seemingly ever larger engines would be produced to haul them from the LMS Beyer Garratt to the British Railways 9F 2-10-0 and the windcutter trains of the 1950s. 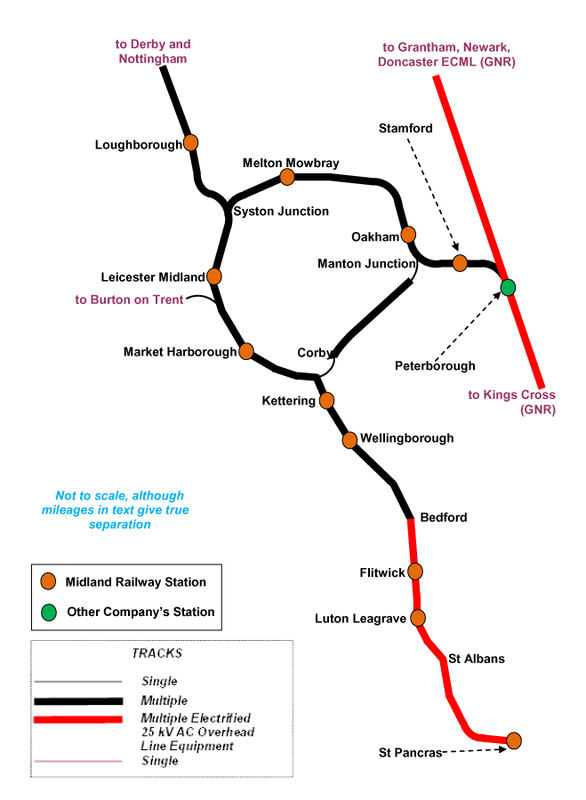 Out past Hendon and Edgware and further north and into Hertfordshire now, but still in commuter land, the station of Elstree and Borehamwood is convenient for the film and television studios, a sort of Home Counties Hollywood. It has seen the likes of the original Stars Wars film and the current BBC TV success Strictly Come Dancing. North of Radlett station the line is crossed by the M25 motorway and this was the site of Radlett aerodrome and the Handley Page aircraft company who manufactured Cold War nuclear bombers in the shape of the crescent winged Victor of the V force. The city of St. Albans had connections with the rival London and North Western Railway, on the West Coast Main Line, it even named one of its Duchess Class Pacific locomotives after the place. But the city was also home to the MR at its City station where the former goods yard, where an LMS 4F freight engine shunting coal wagons could be found is now the station’s car park. The station is now part of the Thameslink network. 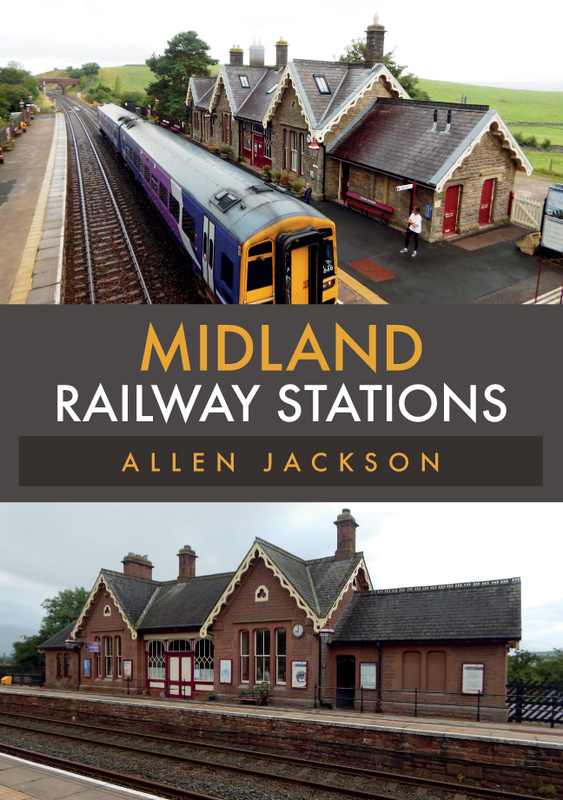 Allen Jackson's new book Midland Railway Stations is available for purchase now.